As fast as the Christmas season came and the day itself went by, the season is now over and everyone is looking to the next big day – we’re all coming to grips. New York City is preparing for its New Year’s Eve celebrations, students and teachers are enjoying their breaks and stores are disassembling their Christmas displays and putting up Valentine’s Day displays. Me? With each passing day, I’m preparing myself for surgery on January 8th and it begins with my pre-admission appointment on Friday. Since finding out two weeks ago, I’ve remained in good spirits but find my thoughts drifting off from time to time. No matter how hard I try not to think about it and remain focused on whatever task I’m doing, I constantly get reminded that this is really happening again; whether it’s going to work and trying to get through the day without getting lost in my thoughts and completing short-term disability paperwork or trying to enjoy Christmas day, a day that typically brings so much joy and serenity. At least I received plenty of gifts to occupy my time while I’m home recovering. Yes, looking forward. 2015 brings new hope and promise and I am excited to see where life takes me next. With a new position at work…to vacations with Ashley…to a clean bill of health. But there is something else that I am very excited about – I was recently elected to serve on the Board of Directors of the CT Brain Tumor Alliance. When I reached out to the CTBTA earlier this year, I did so because I wanted to help. Over the past couple of years, I’ve felt that my true purpose in this life is to provide support, hope and help to those affected by a brain tumor. I served on the first annual “Path of Hope: A 5K Journey for the Connecticut Brain Tumor Alliance” executive committee and assisted in the planning and successful execution of the day. I’ve also brainstormed with the Executive Director and board members regarding implementing a patient-caregiver connection so that nobody has to go through this alone. However, at no point in time did I expect this honor. When I accepted, I notified the Board that I was honored and humbled and cannot wait to get started – and that’s exactly how I feel. Unfortunately, I need to wait. The first meeting is one week after my surgery and I will likely be unable to attend. But then come February, I’ll be ready to go and eagerly awaiting my opportunity to share some ideas that I have with the Board and hope for their approval. So until then, I’ll wait and keep positive. I fully believe that the procedure will go well and the tumor will at long last be 100% gone. So I’m going to ring in 2015 as the beginning of the rest of my life. I’ll get rid of the monster in my head for once and for all, I’ll return to the office in my new position and I’ll also be an integral part of the CTBTA. Great things are on the horizon. I stood there speechless and in shock – how is this happening again? Did he really just say that? Haven’t I already been through enough? Why me? 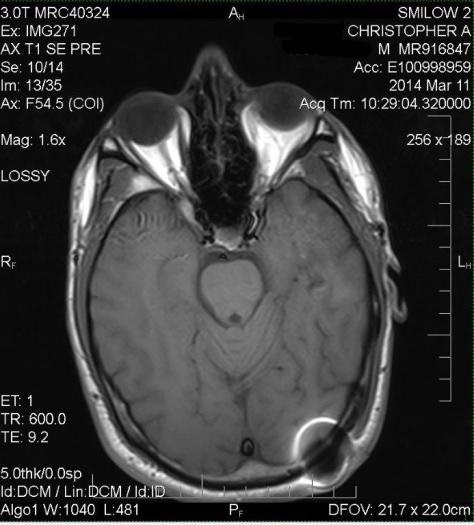 My MRI showed further growth of the spot we have been watching since day one in 2008 and which was radiated last year. 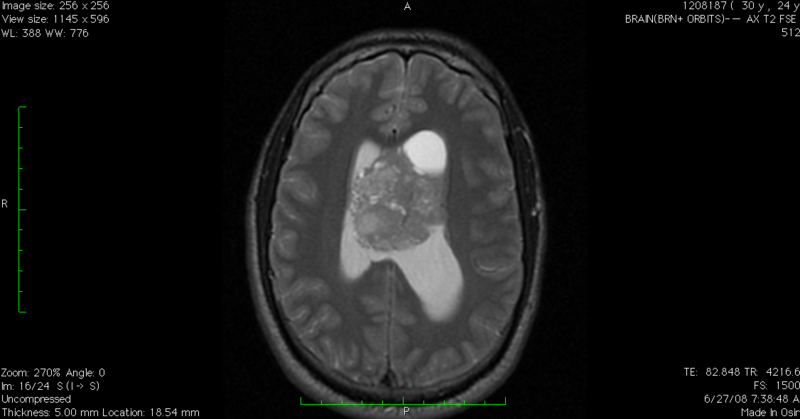 The tumor is the size of a grape and is sitting in the “front lateral horn” of the brain. Thankfully, this is a benign tumor but is acting “atypically”. The typical neurocytoma, once removed and blasted with high dosages of radiation dies off and never grows back. 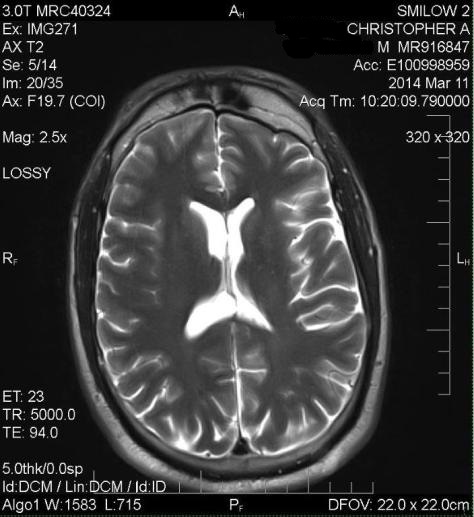 In all of his years, my surgeon has never seen a leftover piece of neurocytoma like mine grow in size after radiation. For whatever reason, likely because this is the story of my life, my tumor did not respond to the gamma knife surgery and is persistent. In the blink of an eye, I went from being in good spirits and thinking of which restaurant Ashley and I would celebrate at, to looking at my calendar to determine when the surgery would be scheduled for. An exact date has not yet been decided upon but it will be sometime in early January. I’ll have to go down to Yale for my pre-op appointment and go through the rigors of surgery all over again. As I sat there listening and absorbing it all, I thought about myself but also the effect this has on Ashley and my family. I am not worried about what will happen in the operating room as I have the utmost and complete faith in my neurosurgeon and doctors. I am not however looking forward to the process of being operated on again and the days/weeks needed to recover. And for my family, I’m sure this is not easy. But together, we will all get through this and have a happy remainder of 2015. As I gather more information, I’ll update you. But if you’re on the other side of this post, do me a favor and enjoy every moment of every day because we don’t know when our fortunes may change. Enjoy this holiday season with family and friends and give thanks and blessings for the everyday gifts we have. Like my family said to me, for a reason that we are all still searching for, I was given this cross to bear and someday/somehow, I will understand why. And you know what, I’m okay with it. I’m not going to stop living or let today’s news bring me down. My surgery has been scheduled for January 8th. For the past few days and in the midst of enjoying the holiday season, I’ve been reviewing my employer’s short-term disability insurance policy to make sure everything can still be provided for. Then, to top it all off, our company has changed health insurance once again and for the fourth time in four years. Fortunately, my surgeon participates in the plan. As if worrying about my health and the procedure isn’t enough, all of the other stresses that inevitably come along with it hit you like a bullet train…a topic for another day. At least it’s almost Christmas and hopefully I’ll forget about all of this for a day. As I sat at my desk today, fleeting thoughts ran through my mind about what tomorrow will bring. But then, I refocused myself and got back to the task at hand. However, something interesting happened along the way. Better yet, I’ll go out on a limb and say my family and I got a sign. Do you remember this post? Well, as luck would have it, it happened again. 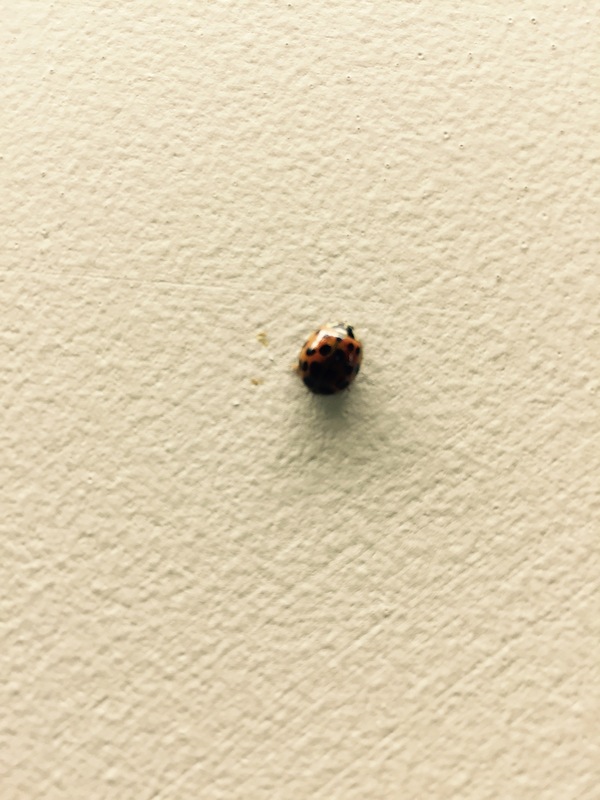 My dad shared with my family and I that when he returned to his office, this pretty lady was sitting on his wall, just waiting to be seen, to let him know that all would be well tomorrow. If that’s not a sign, then I don’t know what is!